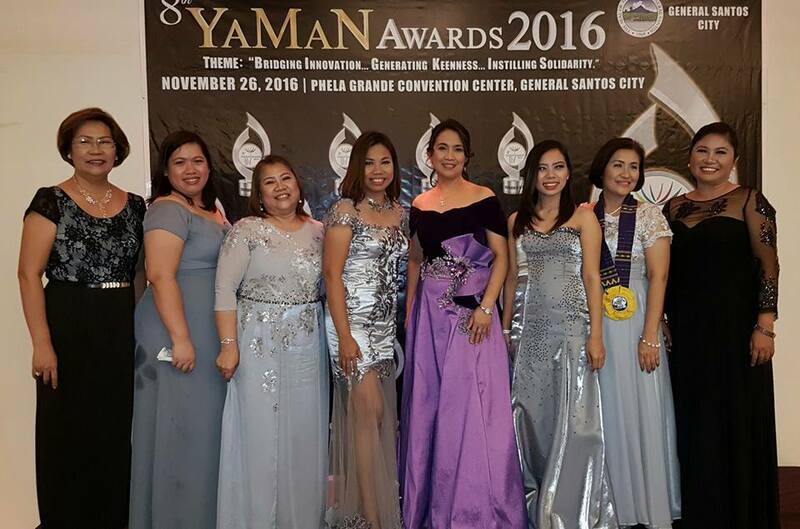 The 8th Yaman Awards, with the theme, "Bridging Innovation...Generating Keenness...Instilling Solidarity" culminated last Saturday, November 26, 2016 at the Phela Grande Events and Convention Center, General Santos City.Taking center stage were finalists in their respective categories from the Business and Cooperative Sectors. Bringing home a cash prize of One Hundred Thousand Pesos (Php 100,000.00) and the most coveted trophy as the Loyal Enterprise of the Year is Jo-Ann's Bakeshop and Fast Food. Jo-ann's is one of the oldest bakeries in General Santos City with the most inspiring story. Now on it's 48th year, Jo-ann's Bakeshop still supplies the best siopao in town, not to mention the best chiffon cake, monay, pagong, blitz tort, etc. 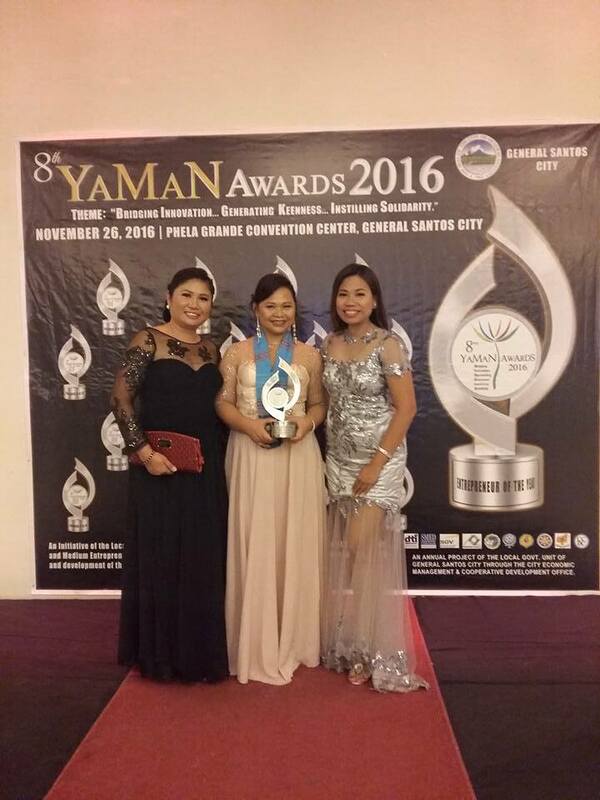 General Tuna Corporation was declared as the Tax Payer of the Year for the second time around having paid their taxes with due diligence. Winners were each given a trophy and a cash prize of P100,000.00. Nanette Guinto-Olarte of Nanette Cake Creations. 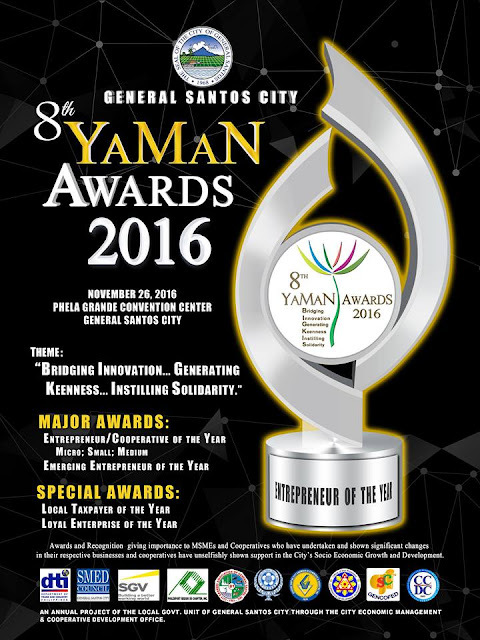 Yaman Awards is an annual activity of the Local Government which gives tribute and citation to Micro, Small and Medium Enterprises (MSMe's) and Cooperatives operating in General Santos City for their outstanding performances and resiliency confronting various socio-economic challenges over the years. 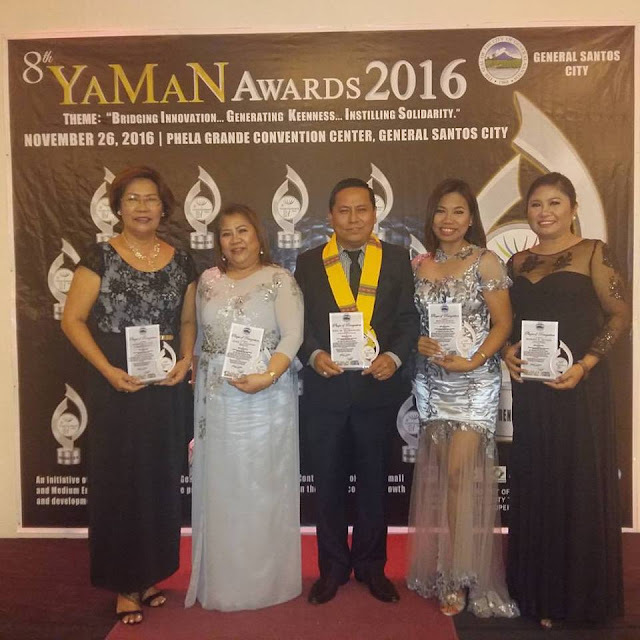 It is also the culminating activity of the City's Business Month Celebration, Yaman Gensan, and is spearheaded by the City Economic Management and Cooperative Development Office (CEMCDO) under the leadership of their hardworking department head in the person of Engr. Riza Marie T. Paches. The term YAMAN stands for Yabong Maliliit na Negosyo. To be eligible for the Yaman Awards, a business/enterprise should be nominated under the Emerging, Micro, Small or Medium Enterprise Categories. After requirements are satisfied, the pre-selection process begins. 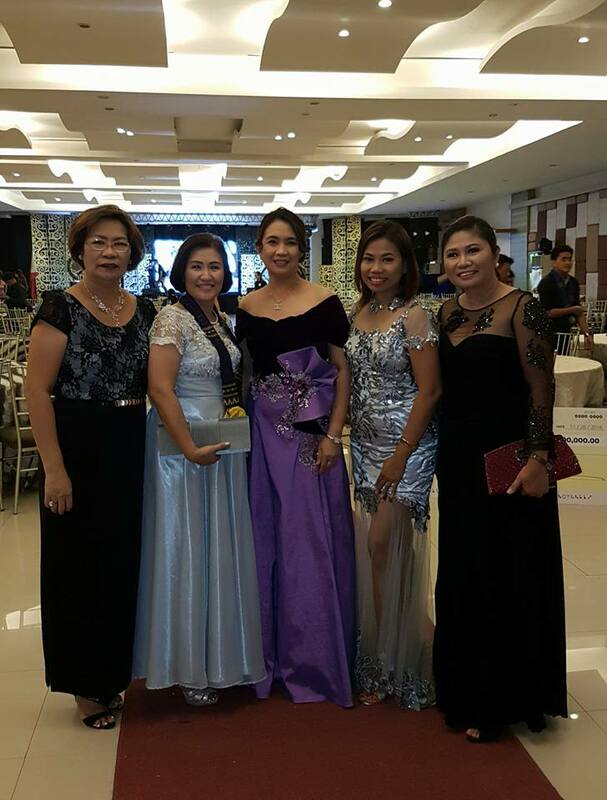 The Selection Committee for Business Sector included the HR Head of the LGU Gensan, Ms. Leah Y. Tolimao, the president of the GSC SMED Council Inc., Ms. Feli Into, the president of PhilExport Region XII, Ms. Marife A. Quiam, the president of the City Bankers Association of General Santos (CBAGS), Mr. Joel Inabangan, and yours truly , Rofil Mae M. Rillo as the Chairperson of the Selection Committee, representing the South Cotabato Filipino-Chinese Chamber of Commerce Inc.
On the other hand, the Selection Committee for the Cooperative Sector is composed of: Ms. Emilia M. Bair, Cooperative Development Specialist II of the Cooperative Development Authority (CDA), Mr. Peelbar Salarda of GENCOFED, Mr. Gary Jumao-as, representing Councilor Dominador Lagare Jr. of the Sangguniang Panglungsod Office of the Committee on Cooperatives and Dr. Emilio Escobillo, chairman of CCDC and the Selection Committee for Cooperative's Chairperson. Tabulation was handled by the Sycip Gorres Velayo and Co. represented by Ms. Jennifer Cheung-Porsuelo, Senior Director. beautiful ladies in silver-gray and black. Photo lifted from Tess Pacheco's FB account.